The decision that seemed inevitable has finally been made. 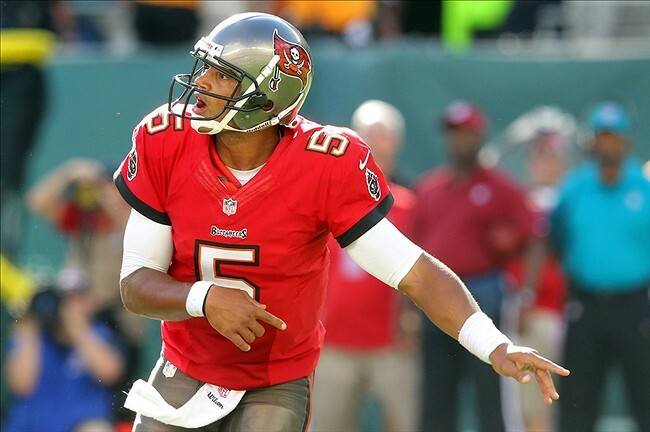 Quarterback Josh Freeman is walking the plank. The Bucs, off to an 0-3 start and sputtering badly on offense, have benched Freeman in favor of Mike Glennon. The rookie from North Carolina State will make his first career NFL start on Sunday against the Cardinals at Raymond James Stadium. After setting passing records last season, Freeman never got his act together through the first three games of 2013. He completed just 45% of his passes (43-of-94) for 571 yards, two touchdowns and three interceptions. Tampa Bay has only scored 34 points through three games. Only Jacksonville has scored fewer. Yes, his receivers have dropped some passes. But in the NFL, when things are not going well, the quarterback is the first player on the offensive side of the ball to take the fall. And if things continue to go south, how much longer will Greg Schiano be the head coach? Then there are the off-the-field issues: missing the team photo, not being elected as team captain. Freeman is in the final year of his contract, and you have to wonder if he’s played his final game in Tampa Bay. There are rumblings that the Bucs are willing to trade him. The Bucs picked Glennon in the third round of this year’s draft. He becomes the third rookie QB to start in the NFL this year. Geno Smith (Jets) and E.J. Manuel (Bills) are the others. The way things have gone so far, Tampa Bay had to do something to shake things up. We’ll find out if Glennon is the Bucs’ quarterback of the future. He has 13 games to show what he’s got, starting Sunday against Arizona. 13: The number of penalties committed by the Bucs. That is way too many. And by the way, that doesn’t include the penalties that were declined. 5: The number of times the Jets got a first down as a result of Tampa Bay penalties. 4.2: The number of yards the Bucs averaged per play. That’s not going to get the job done. 65: The number of rushing yards Doug Martin had. It’s no secret that other teams are going to stack the line of scrimmage to try and stop Martin this season. But if Josh Freeman can’t even complete half of his passes, as was the case Sunday, well I think you know where I’m heading with this. 154: The number of receiving yards Vincent Jackson had on Sunday. Yeah, he’s good. 5: The number of times the Bucs sacked Geno Smith. That’s encouraging. 3: The number of times the Jets sacked Freeman. That’s not encouraging. That was pathetic. That was disgusting. There are other words to use, but those two will suffice for now. 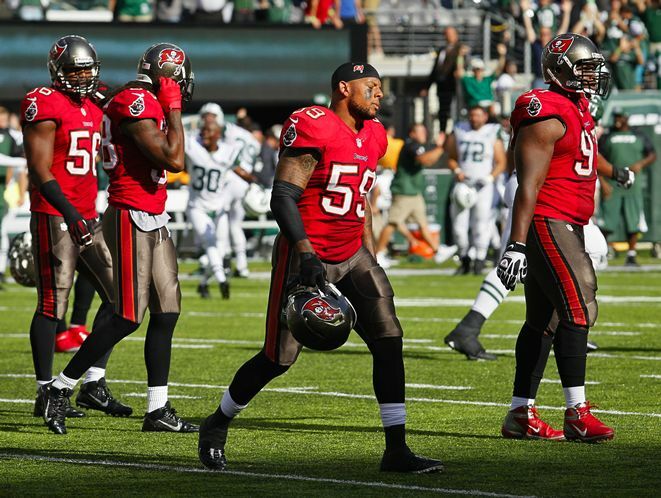 The Buccaneers lost to the Jets in the season opener Sunday afternoon at the Meadowlands, 18-17. The Bucs seemed to have the game wrapped up when Ryan Lindell kicked a 37-yard FG with 34 seconds left. Heck, the ensuing kickoff went for a touchback. But then Jets quarterback Geno Smith hit a long pass play. Then came the stupid play of the game: Lavonte David hit Smith as he was running out of bounds. The personal foul put New York in field goal range, and Nick Folk took care of that with 2 seconds left. There are many people to point the finger at. Let’s start with the penalties: 13 of them for a whopping 102 yards, including the costly 15-yarder by David at the end. I do question the two personal foul calls on Dashon Goldson. Hey refs: are you not allowed to pop receivers anymore? There was no helmet-to-helmet contact, and that claim of a “defenseless receiver” was garbage. But I digress. 13 penalties=lack of discipline. Lack of discipline=bad coaching. Greg Schiano deserves the blame for that. 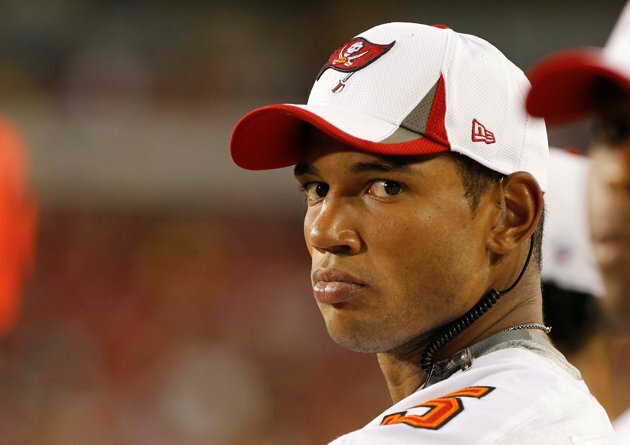 Let’s move on to Josh Freeman. He was so-so. He completed just under half of his passes, he threw an interception right to a Jets’ defender, and he was sacked three times. And what the heck was up with the play-calling communication at the very beginning of the game? Don’t you need to have a backup plan when the device inside the helmet isn’t working? The Bucs burned two timeouts during that debacle, and were flagged for delay of game after one of those stoppages. Yet through it all, Freeman led the Bucs into field goal range in the final minutes, and gave his team a chance to win the game before the last-second meltdown. Defensively, the Bucs played pretty well – well, aside from the final 34 seconds. They sacked Smith five times and forced two turnovers, two areas that were a concern going into the season. Darrelle Revis had a strong game against his former team. But the meltdown – topped off by the stupid penalty by David – is what we’ll remember more than anything. Doug Martin couldn’t get much going against a good Jets’ defense, though he did find the end zone following a Jets turnover. Vincent Jackson had a monster game: 7 catches for 154 yards, including a huge play on the Bucs’ final drive. He hasn’t missed a beat from last year. Mike Williams caught a TD pass. FINAL THOUGHT: it may have been David’s stupid penalty that ultimately cost the Bucs the game. But it was ALL of the penalties that stand out to me at the end of the day. That’s a coaching problem, and it needs to be addressed. NEXT WEEK: the home opener against the Saints. 1. Darrelle Revis. This is the headliner, obviously. He’s playing his first game for Tampa Bay against his former team. 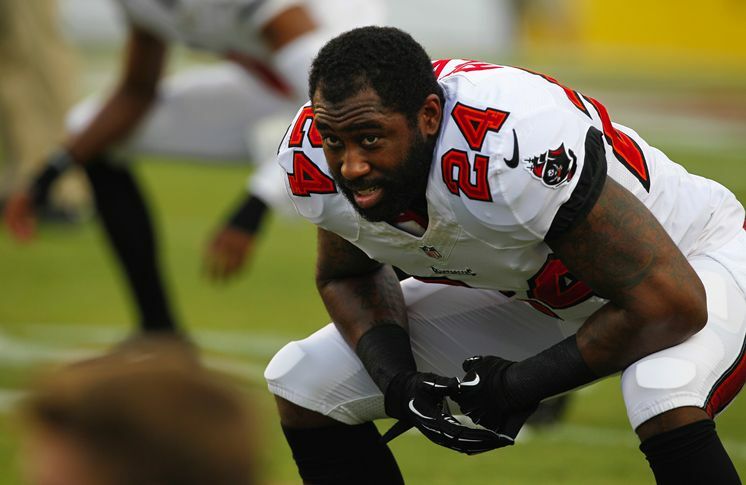 The Bucs acquired Revis in exchange for two draft picks just before this year’s draft. Revis is recovering from a serious knee injury, and didn’t play at all in the preseason. But he says he’s ready to go. And why wouldn’t he want a little revenge against his former team? 2. The defense. If the down linemen can’t get any pressure on the quarterback, then Revis, Dashon Goldson and the rest of the secondary can only cover for so long. The Bucs had the worst pass defense in the league last year, and some (but hardly all) of that can be attributed to a lack of sacks. The defensive front will be facing Geno Smith, the rookie out of West Virginia. Some so-called pundits think Tampa Bay is catching a break in that regard. I beg to differ. Much of the buzz in New York has been about Smith, Rex Ryan and Mark Sanchez. But if the Bucs’ defense can’t muster any pass rush, it may not matter. 3. The offense. Last year, Josh Freeman threw for over 4,000 yards. But he’s been inconsistent, especially down the stretch of 2012, when a 6-4 record turned into 7-9 and no playoff berth. He did not play well in the preseason for what it’s worth, and spent a lot of time on his back. We still don’t know if Carl Nicks will be ready to go. Davin Joseph is back after suffering a season-ending injury. This unit has to do a better job of protecting the quarterback. As for Doug Martin? No need to worry about him for the time being. Kickoff is at 1:00 on FOX. Your announcers are Kevin Burkhardt and former Buc John Lynch.